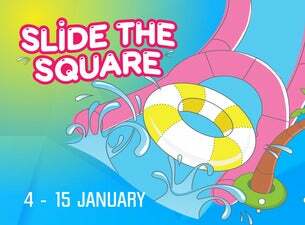 Providing 75 metres of slip ‘n’ slide fun, Slide The Square is here for just 12 days in January. What a way to escape the city heat! Bring your friends and family for a wet and wild ride down the slope of The Square – make sure you pack bathers or a change of clothes. We’ll have change rooms for you to use on site. The best part? Most of the water used for Slide The Square is recycled into tanks to water Fed Square's gardens. Get your tickets before the general public and book today! IMPORTANT: ALL PARTICIPANTS MUST AT LEAST 110CM TALL TO SLIDE. This restriction is in place for both safety and insurance reasons and so as to comply with industry standards. There is no age restriction to slide (providing that the slider is at least 110cm) but children under 12 years old must be supervised by an adult guardian at all times. All sliders also need to be under 120kgs.